Inside the wheels are the bearings which are the little metal donuts. They are rated by what is called an ABEC rating from 1 to 9 which are almost meaningless for skateboarding. 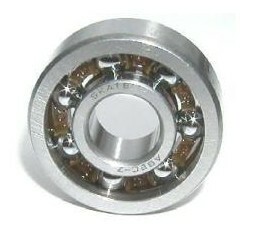 That is because the rating is for the precision of a bearing for how they would work in a machine not a skateboard. An ABEC rating of 3 to 5 usually works for skateboarding because that means they are not so precise that they will break easily, but smooth enough so they are good for riding. When you need to replace bearings or want to build your own custom deck you have a lot of choices. For most of us spending a lot of money on the most expensive bearing is just going to waste money on something we don't really need and will be easy to ruin. Most bearings have 8 balls within them. Newer designs are changing the size of the balls, the material they are made out of, and even the number of the balls. Bones has a 6 ball design that can take higher stress loads. These are intended for people doing high stress load tricks like ollieing huge stairs. Seizing up is the bigger problem for bearings though. Most skateboarders replace bearings because they get dirt in them and stop spinning long before they would ever break them. Consolidated Skateboards makes a daredevil filtered bearing that is supposed to keep the dirt out. Another design is Oust Bearings. They created a patented design that is supposed to prevent the bearings from being worn out by friction by reducing the balls chances of making contact within the casing. You can find these by looking for "Powered by Oust" on the packaging label.